Sources from the "upstream supply chain" indicate that the rumored Nokia Windows 8 tablet is on the way to become reality in Q4. Nokia is reportedly going to use a dual-core Qualcomm Snapdragon S4 chipset for its 10" slate. The Finns have apparently outsourced the production to Compal already, with the first batch out of the conveyor belts expected to be 200, 000 units. Nokia has given hints and indications before that it might be interested in entering the tablet game, but before Windows 8 hits it isn't able to do so, of course. Things are starting to get very dynamic in the tablet space this year - the new iPad just upped the ante with its high-res display, Android manufacturers are decking up their offerings as we witnessed firsthand at the MWC expo, and Windows-on-ARM might prove the wild card once it hits in Q4. Definitely a high-stakes game shaping up. Make it the same price as iPad and it will be a hit!!!!!!!!!!!!!! that's still outrageous price.. make it the same price as the Kindle Fire, or at least the Transformer 300, then it will be a hit.. add USB-OTG, microHDMI and keyboard dock, then i'll gladly part with my laptop..
Hey, might as well throw in a Ferrari while they're at it. Does the Kindle Fire come with the full Android OS, USB OTG, microHDMI, keyboard dock? If it did, would it still be offered at its current price? it is only a nokia tablet with windows 8 that can sell more than the apple ipad. cant wait cos i know everyone will love a full pc on a tablet. 2012 is looking better by the day. But why Q4 if they have already "outsourced the production to Compal" ?? Slow & Steady wins the race !!! Well Nokia was a great Mobile Phone company. Now it will be a great Windows Company, as they are venturing into tablets zone. Windows 8 definitely looks promising! Let's hope someone will offer a transformer type device. Additionally, the cost for apps should come down significantly! Currently WP7 apps are overpriced compared to IOS and Android! Give it booming stereo speakers, micro HDMI, 64GB, and USB-OTG and I'm in. this is a make or break year for nokia and they must come with a bang. This year we will see best products from nokia. 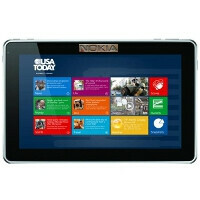 Windows 8 tablet from nokia i have been waiting since the feb 11 anouncement. This will be my first tab and no stopping. I've already said my 2nd Windows Phone device will be a Nokia Lumia WP8 device (Apollo). And as there's always a first time for everything - who knows but my 1st ever tablet might be a Nokia too! A Nokia W8 tablet! my worry about the Nokia Tablet is this Folks. so far only the Intel x86 Windows 8 tablets are capable of running nearly ALL Windows 7 PC/Laptop Programs that means the Intel CPU chipset windows 8 Tablet computers come to the market with thousands upon thousands of full windows PC/Laptop Programs for Business or Pleasure for People to choose from. The other Windows 8 tablets chipset are said to be Risk CPU and Windows 7 full PC programs have to be re written to run on them. I am sure there will be a lot of good programs (APPS) written to run on them for sure but the X86 Intel CPU chipset Windows 8 Tablet computers come to the market already able to run nearly all windows 7 Desktop/Laptop computer business, Games Programs and interface thousands upon thousands of devices you can hook up to a PC. if they cam make the Windows 8 tablets have good battery life WOW folks they will be worth buying for sure. My only hope is that the design resembles the Lumia 800/900/or N9. With the possibilities of it coming in different colors. That would be totally awesome! we all know that NOKIA was very well known in making high quality and durable hardware and on the software side is handled by MICROSOFT. i can't imagine the result... would be one the best and well balanced tablet. its time for them to step up and earn the no1 rank just like before. YOU IDIOTS @ NOKIA MAKE IT FAST. CANT WAIT TO BUY IT!! :-) LOVE THE DESIGN! AND Windows METRO sTYlE U ROCK NOKIA! How many have read this article? Very well could be the foundation for a revolutionary Nokia Tablet that Elop has hinted at in the past. http://www.slashgear.com/microsoft-patent-takes-the-transformer-prime-one-step-further-08217529/ It would be the way to go for a Windows tablet.